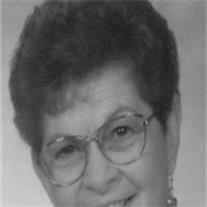 Myrna Stratton Abel, 77 passed away peacefully at home surrounded by her loving family July 2, 2009. She was born September 8, 1931in Flagstaff, AZ. She was preceded in death by her husband Donald A. Abel, loving son Ronald L. Abel, her beloved daughter Cathleen L. Wellington and granddaughter Nicole Wellington. She is survived by her beloved children and their spouses; Donald (Carol) Abel, Peggy Abel, Daniel (Debbie) Abel, Steve Wellington, Christy (Charlie) Cluff, Patrick (Anne) Abel, Ruth (Steve) Whitney. Myrna is also the adored grandmother of 40 and loving great-grandmother of 16. She is also survived by her beloved sister, best friend and missionary companion Helen Fort, her loving brothers, Lawrence (Barbara) Stratton, Mike (Vickie) Stratton and numerous nieces and nephews who will miss her greatly. Myrna was an active member of the Church of Jesus Christ of Latter-day Saints and served missions to the Philippines, England, Las Vegas, Los Angeles and Salt Lake City. We will miss her positive attitude, steadfastness in everything she did, and the special way she had of making us all feel important. She was an Angel here on earth. Visitation will be 6:00 to 8:00 PM, Tuesday, July 7, 2009 at Bunker’s Garden Chapel, 33 N. Centennial Way in Mesa, Arizona. Services will be on Wednesday, July 8, 2009 at 10 AM, preceded by a visitation at 9:00 AM at the Church of Jesus Christ of Latter-day Saints, Mountain View Stake Center, 1550 N. Val Vista Dr. Mesa, AZ.